The Dane G. Hansen Foundation of Logan presented a check for $1 million dollars to the Kansas Historical Foundation on Monday, December 7, 2015. The generous gift will support the renovation of the main entrance gallery in the Kansas Museum of History in Topeka. 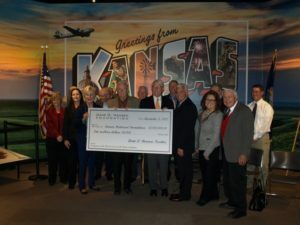 The gift is the largest received in the Kansas Historical Foundation’s history. The museum, operated by the Kansas Historical Society, opened more than 30 years ago to tell the story of Kansas and has never undergone a major renovation. New displays are being planned for the entrance gallery which will incorporate current technology and encourage Kansans to experience the state’s history in a new, exciting way. More than 1.5 million people have visited the since its opening in 1984. The Kansas Historical Foundation, and the Kansas Historical Society are celebrating their 140th anniversary this year.